Amazon India is selling Godrej 6.2 kg Fully Automatic Top Load Washing Machine (WT 620 CFS) Rs.11490 only which is worth for Rs. 16100 at lowest and best price online.You can buy from flipkart also with Same price .You can follow the below steps to buy this product at their deal price.Keep Visiting dealsheaven.in for more Best offers ,hot online deals, promo code, coupons and discount . Unlike most washing machines which offer a two-way wash action, Godrej's revolutionary force 4 technology provides a four-way action against dirt. A clockwise-anticlockwise movement of the pulsator is further enhanced with an up-down movement of the punch which generates a powerful four directional water force. This Force 4 Technology literally forces out the toughest dirt from the most difficult- to- clean areas, ensuring the cleanest wash. If the water flow stops during the water filling process, the machine starts hibernating. If the water level shows no rise in level in the next 15 minutes the machine indicates by sounding beeps and flickering LEDs. Advantage: Protects the water inlet valve from burning out over time. The intelligent micro-computer controls all operations precisely to ensure a perfect wash. The machine is equipped with fuzzy load and quality sensing to determine the water level and wash cycle appropriate for the wash load. Washing, rinsing and spin drying happens with a single selection on the control panel. Ensures that your program settings stay the way you had set them in case of a power failure. What's more, a buzzer informs you of the machine restarting. 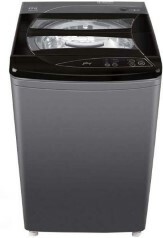 How to buy Godrej 6.2 kg Fully-Automatic Top Loading Washing Machine (WT 620 CFS, Graphite Gray)?